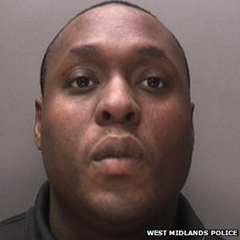 A man has been found guilty of murdering another man by stamping on his head at a pub in the Black Country. Dominic Fraser, 32, from Highfield Road in Tipton, stamped on 30-year-old Kevin Hadley's face at Great Bridge's Lounge Bar last year. A post-mortem examination showed Mr Hadley died from "blunt force trauma" to the head and suffered a severe brain injury, police said. Fraser was found guilty at Wolverhampton Crown Court. 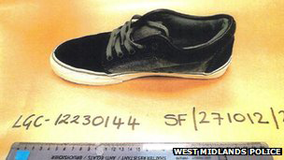 He stood on Mr Hadley with such force that he left footprint marks across his face, West Midlands Police said. Mr Hadley and 52-year-old Kevin Hadley Snr, both from Slater Street, West Bromwich, had each drunk around 10 pints of beer on 16 October before going to the Lounge Bar. Mr Hadley Jnr was described as acting aggressively and his self control "blurred by alcohol" when he squared up to a group of men playing pool. He was struck with a pool cue swung by another man, Shazad Ali, 24, from Tudor Street in Tipton, before Fraser kicked Mr Hadley Jnr in the head. CCTV footage showed it was Fraser who stamped on the victim. Police said Ali had already admitted manslaughter and would be sentenced with Fraser later this month. Sgt Mike Griffiths said: "This is a very sad case in which alcohol has impaired people's judgement and self-control and the result is one young man dead and another facing the prospect of being jailed for life. "It's undeniable the victim started the altercation but the level of violence used by Fraser was grotesque and unjustifiable." Three other men had also admitted their parts in the fight at earlier court hearings, police said.